We are one of the widely acclaimed manufacturers, exporters and suppliers of Jute Christmas Bags. The offered jute christmas bags are specially designed for packing the christmas gifts and sweets. Our supplied jute christmas bags are made from high grade jute fiber for ensuring longer serviceability and durability. Jute Christmas bags are available in a medley of designs and stand apart because of the earthy looks and eco-friendly nature of the fiber. Christmas Bags are available in innumerable shapes and sizes as per the choice and requirements of individual buyers. 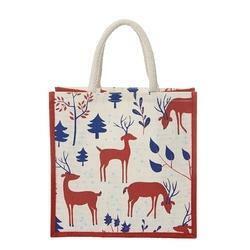 Christmas bags with attractive prints make excellent Promotional or Gift or Packing items during the festive season. Size: 8" x 8" x 4"
Aimed at prosper growth in our domain, we are instrumental in providing an excellent quality Christmas Jute Bag. With massive market understanding and competence in this business realm, we are immersed offering Christmas Bag. These bags are available in various designs, colors, sizes and prints as per the requirements of clients. Perfectly designed using high quality cotton fabric, these bags are widely demanded in the industry. Being the leading firm in the industry, we offer designer array of Jute Christmas Bag that are classy in looks and are extremely stylish in nature. They are extremely stylish in looks and are environment friendly in nature. Jute Christmas Bag is compact in nature and comes in varied eye-catching shades. 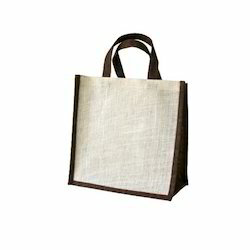 Meeting with the requirements of the clients, we are involved in offering a quality approved array of Christmas Jute Bag. The Christmas Jute Bag we offer is widely demanded for its availability in different designs and colors. These products are widely used at the time of Christmas and thus have different prints on it. A bag full of happiness and prosperity to enliven the Christmas spirit. feast your eyes on the fascinating range and get the freedom of choice.